UNDRILLED AND DRILLED,PLAIN AND SELF-LOCKING, ALLOY STEEL AND CORROSION-RESISTING STEEL,UNF-3A THREAD. (a) THESE THREAD SIZES ARE PREFERPED PER SPEC MIL-S-7742. (b) “M” MIN (5 THREAD PITCHES)-REGION OF MINIMUM ENGAGEMENT WITH FULL FEMALE THREAD REQUIRED TO MEET SPEC MIL-F-18240 REQUIREMENTS. LOCKING ELEMENT WITHIN “M” REGION MUST DEVELOP REQUIRED TORQUE WHEN TESTED IN ACCORDANCE WITH SPEC MIL-F-18240. LENGTH OR DIAMETER OF LOCKING ELEMENT MAY BE MORE OR LESS THEN “M” PROVIDING ALL OTHERS REQUIREMENTS ARE MET. (c) “N” – ONE (1) COMPLETE THREAD PLUS UNTHREADED PORTION OF END.FOR EASE IN STARTING.LOCKING ELEMENT SHALL NOT BE EFFECTIVE WITHIN THIS AREA. (d) SCREWS WITCH HAVE A LENGTH LESS THEN THE MINIMUM BASIC THREAD LENGTH,SHALL BE THREADED AS CLOSE TO HEAD AS PRACTICABLE. (e) DRILLED HOLE DATA IN ACCORDANCE WITH PROCUREMENT SPEC FF-S-86. SCREW SIZES NO. 4 AND NO. 6 SHALL HAVE TWO (2) DRILLED HOLES SPACED 180°. SCREW SIZES NO. 8 THRU 1 INCH SHALL HAVE SIX (6) DRILLED HOLES SPACED 60°. (DRILLED HOLES NOT APPLICABLE TO SCREW SIZES BELOW NO. 4). THREADS: THREADS IN ACCORDANCE WITH SPEC MIL-S-7742. MATERIAL : ALLOY STEEL IN ACCORDANCE WITH PROCUREMENT SPEC FF-S-86. CORROSION-RESISTING STEEL IN ACCORDANCE WITH PROCUREMENT SPEC FF-S-86. FINISH : ALLOT STEEL-CADMIUM PLATE IN ACCORDANCE WITH SPEC QQ-P-416,TYPE II,CLASS 3. – BLACK OXIDE IN ACCORDANCE WITH SPEC MIL-C-13924,CLASS 1. CORROSION-RESISTING STEEL – CADMIUM PLATE IN ACCORDANCE WITH SPEC QQ-P-416,TYPE I,CLASS 3. -PASSIVATE IN ACCORDANCE WITH PROCUREMENT SPEC FF-S-86. CODE : METERIAL CODE,”-“= ALLOY STEEL. FIRST CODE DASH NUNBER DESIGNATES SCREW THREAD SIZE AS TABULATED. TYPE CODE,”-” = UNDRILLED HEAD. “LE” = SELF -LOCKING MALE THREADED FASTENER. “LL” = SELF LOCKING MALE THREADED FASTENER. 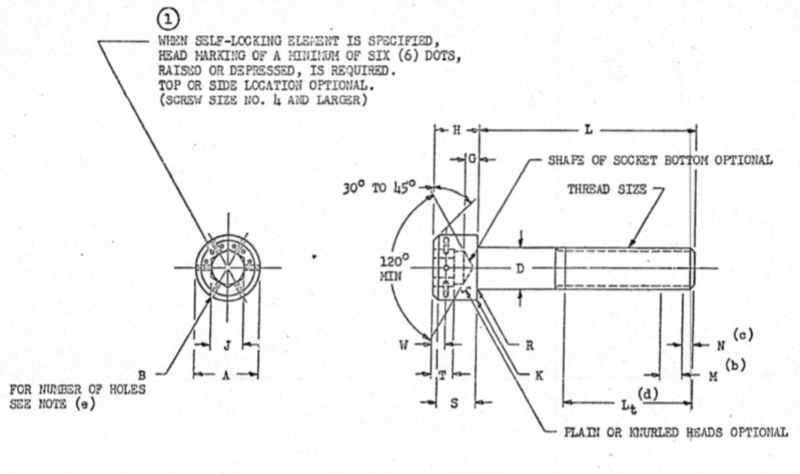 (LONGITUDINAL STRIP LOCKING ELEMENT IN ACCORDANCE WITH NAS1283,TYPE L). “LN” = SELF LOCKING MALE THREADED FASTENER. (PELLET LOCKING ELEMENT IN ACCORDANCE WITH NAS1283,TYPE N). SECOND DASH NUMBER DESIGNATES NOMINAL LENGTH IN SIXTEENTHS OF AN INCH AS TABULATED. TABULATED CODING INDICATES PREFERRED LENGTHS. ADDITIONAL LENGHTS AVAILABLE ON SPECIAL PRDER ,MINIMUM RUN BASIS. AND IN 1/2 INCH INCREMENTS FROM 3-1/2 INCHES UP TO AND INCLUDING 6 INCHES. FINISH CODE,ALLOY STEEL “P” = CADMIUM PLATE. NO SUFFIX CODE FOR BLACK OXIDE. CORROSION -RESISTING STEEL ,”P” = CADMIUM PLATE. NO SUFFIX CODE FOR PASSIVATE.